Today's top stories feature Matthijs De Ligt, Take and Jovic. Here are the top transfer news and rumours of the day surrounding the Catalan giants! Sport reports that De Ligt already gave the green signal for the move and the Barcelona board are currently set to offer De Ligt a five-year deal till 2024. Matthijs De Ligt is a product of the famed Ajax academy, which is one of the best in the world and has produced some all-time greats. Known for his superior defensive abilities, it is rare of a player at his age to lead a side. After having already secured Frenkie De Jong, De Ligt's teammate, in the January transfer window, the Blaugrana hierarchy are speeding up negotiations to close the deal for De Ligt. The Catalan giants are confident that the Ajax defender will choose Barcelona, just like his teammate. While Blaugrana president Josep Maria Bartomeu already admitted the club's interest on Ajax prodigy, another Dutch league player claimed that De Ligt hopes to join Barcelona. Pol Llonch, who currently plays for Willem II, faced Ajax couple of weeks ago and revealed what he talked with De Ligt. “I asked him directly if he would end up signing for Barça and he told me that he hoped so, but that he didn't know anything at the moment. He said: 'I hope so.' I didn't speak with De Jong." 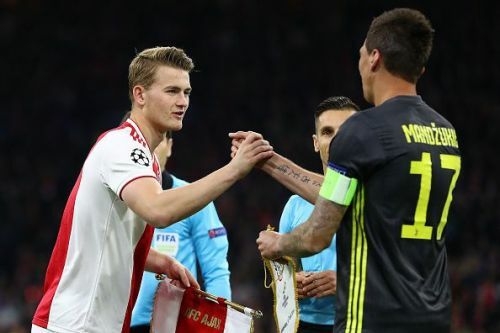 Moreover, Ajax coach, Ten Hag, claimed that De Ligt will join Bayern Munich and Barcelona. “There is zero chance that De Ligt will continue at Ajax. There are too many clubs interested in him. He will leave us this summer, but I don't know if he will go to Bayern or Barcelona,” Ten Hag told German daily Süddeutsche according to AS." According to the report, De Ligt will cost around €60 million. But as Barcelona is in pole position, Juventus will go for Barcelona defender Samuel Umtiti. If reports are to be believed, the Serie A giants are not interested to engage in a transfer battle with the Catalan giants, which is why Juventus will try to secure Samuel Umtiti.